Jefferson Confidently Returns To Work (Times-Pic) - Saying "I have no fear," Rep. William Jefferson, D-New Orleans, returned to Capitol Hill on Monday to cast his first votes since being indicted a week ago on federal corruption charges. Jefferson's Fight Costly (The Advocate) - U.S. Rep. William Jefferson is facing legal bills that could reach $2 million to fight complex public corruption charges that include bribery, racketeering and money laundering, lawyers said. 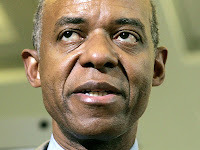 Group Forms To Support Jefferson (The Advocate) - A group calling itself the Justice for Jefferson Committee has formed in support of indicted U.S. Rep. William Jefferson, D-New Orleans.